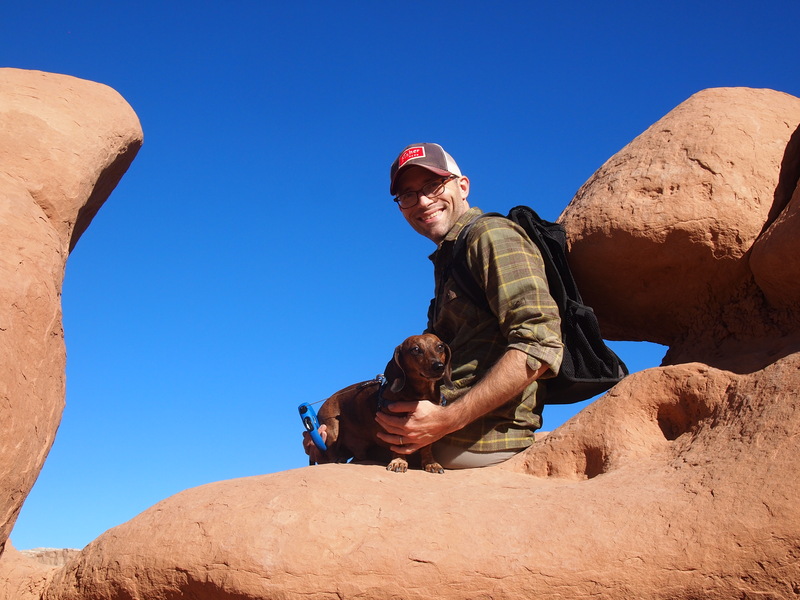 After we staked out our spot at Temple Mountain RA, I wanted to spend the afternoon exploring Goblin Valley State Park. 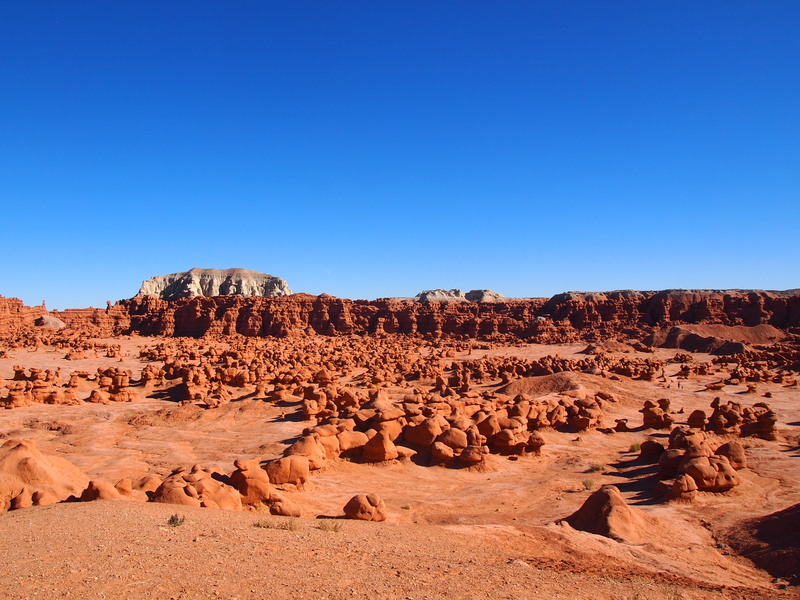 Goblin Valley SP is a relatively small area within the San Rafael Swell but well worth visiting. 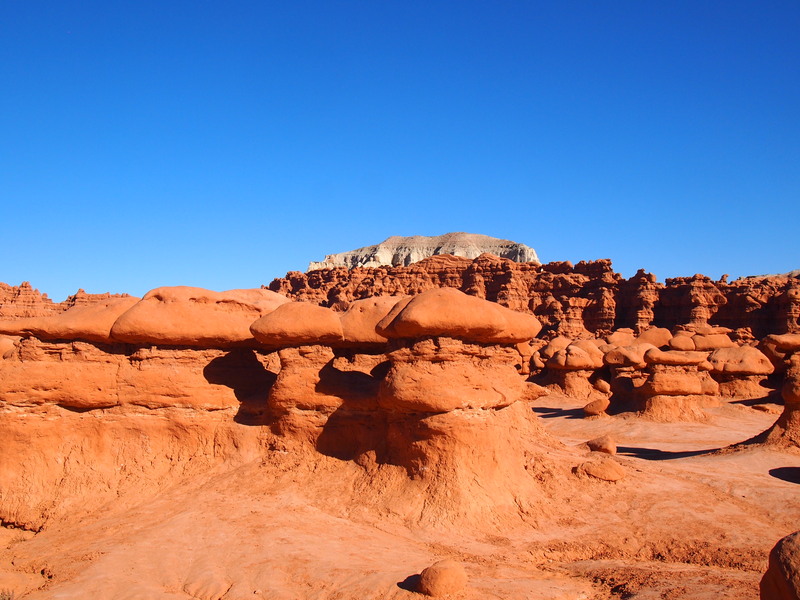 Its valley of mushroom-shaped hoodoos is truly spectacular and unlike anything else we’ve seen in Utah thus far. On our way to the park, we passed Wild Horse Butte. 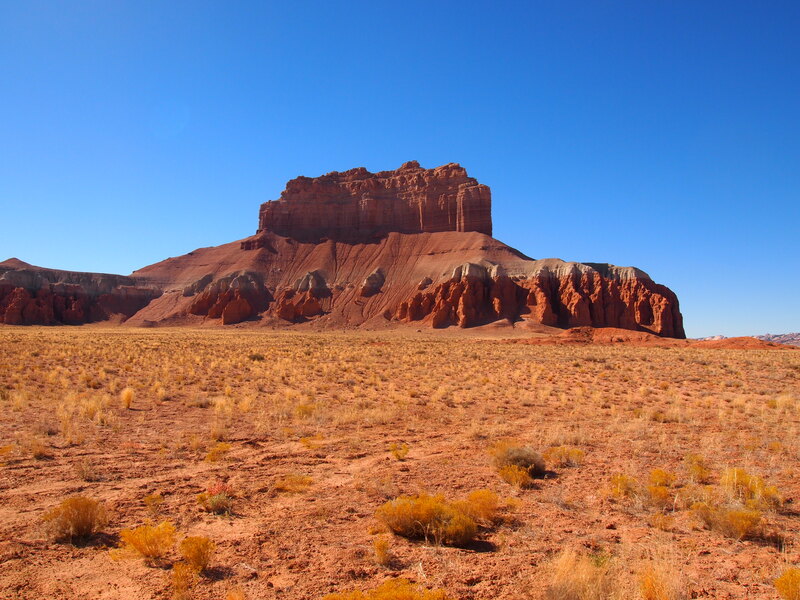 It’s an impressive sight in its own right, an imposing red sandstone mass thrust out of the valley floor. 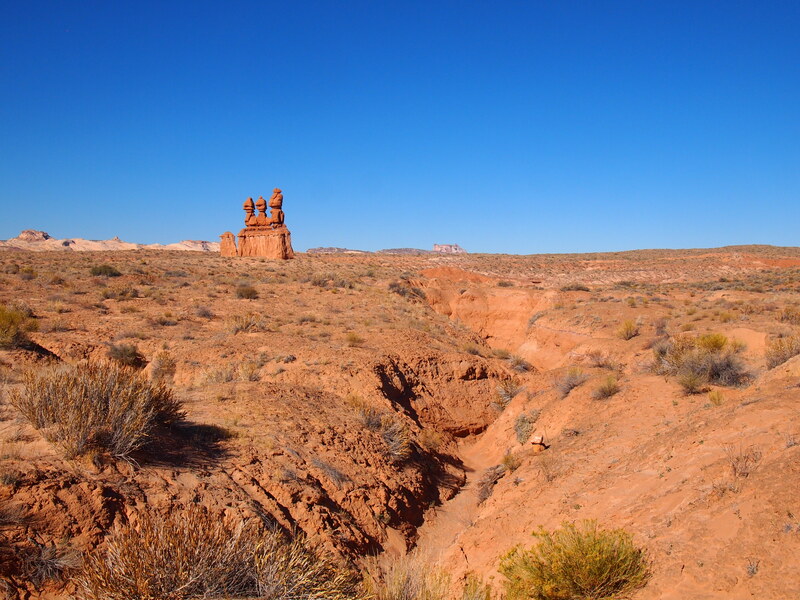 John C. Fremont’s expedition passed by the butte on their way to Cathedral Valley (now a part of Capital Reef NP) in 1854. Soloman Carvalho, the expedition’s photographer, took a daguerreotype of the butte and it’s one of the few surviving photos from that trip. Sadly, most of Carvalho’s prints were destroyed in a warehouse fire. I always love seeing how landscapes connect us across time. 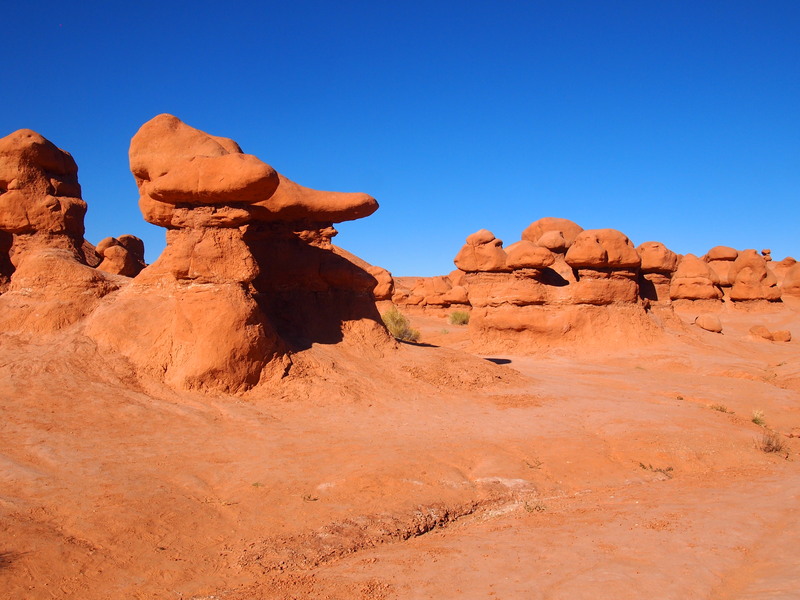 Park information notes that Goblin Valley was first discovered by cowboys searching for lost cattle. 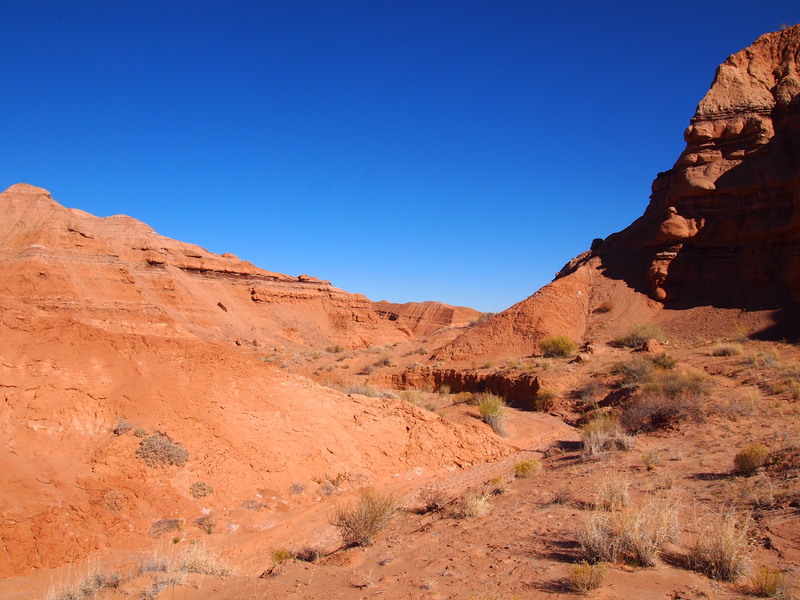 However, the area is full of pictographs and petroglyphs from native populations which clearly suggest the valley’s existence wasn’t a complete mystery. The park’s modern history dates back to the late 1920s when Arthur Chaffin discovered the valley, calling it Mushroom Valley. Chaffin returned to the valley in 1949 to photograph the formations and examine the valley more in depth. 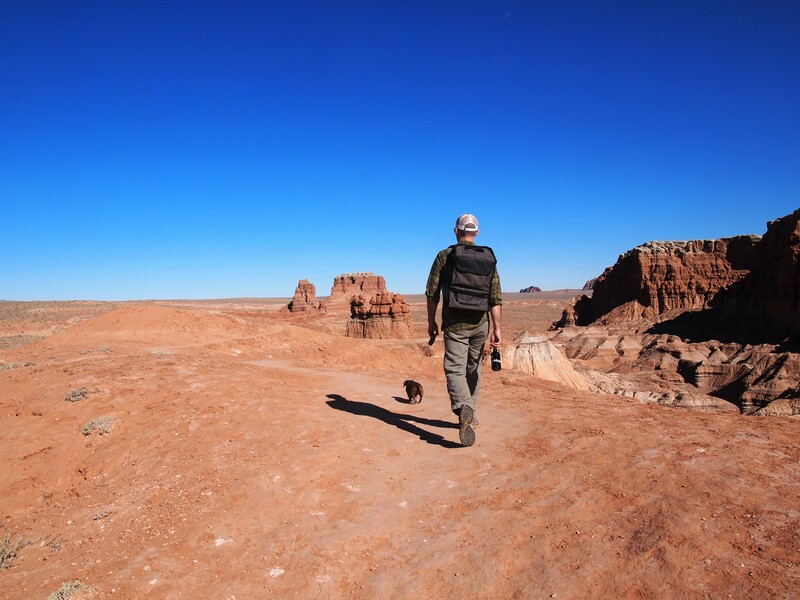 The valley wasn’t designated as a state park until 1964. Surprisingly, every website I looked at spewed the exact same information about the park’s discovery. I would be interested to find a more substantial accounting of the park and its history. John Fremont’s survey team was nearby, did they not see this valley of goblins? 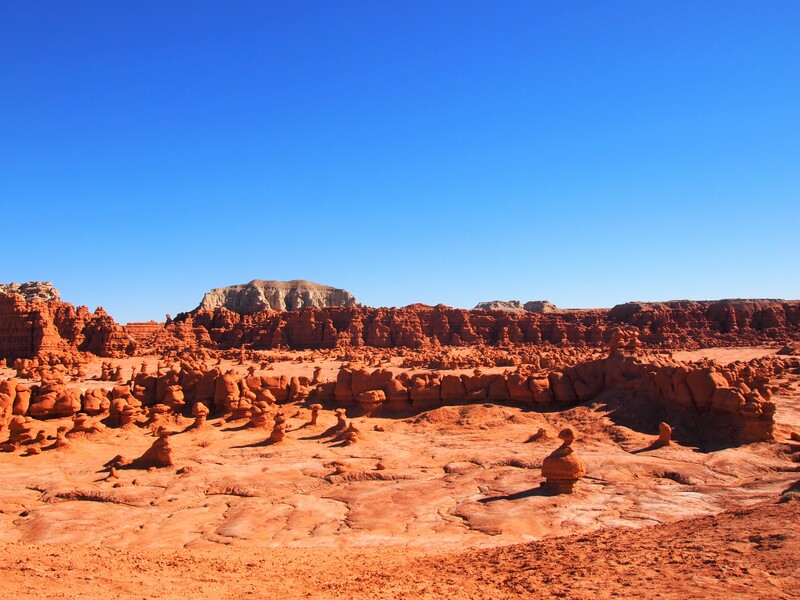 What prompted the change from Mushroom Valley to Goblin Valley? 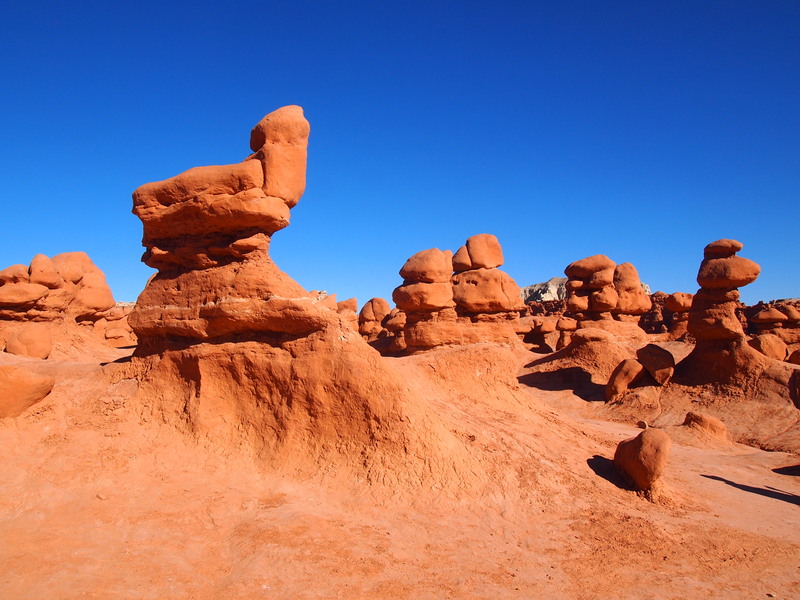 One of the greatest aspects of Goblin Valley SP is that visitors are allowed to roam around the valley floor in and among the hoodoos. If I had come here as a kid, it would have been my favorite place! You can climb and scramble onto the goblins, peek through windows in the rock, and just wander aimlessly. 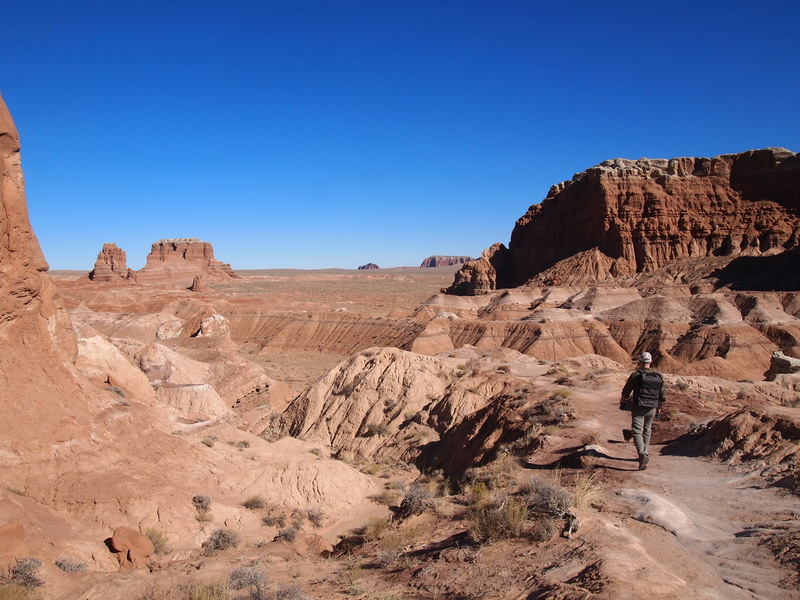 There are three marked valleys in the park brochure, but we only strolled through the first one. 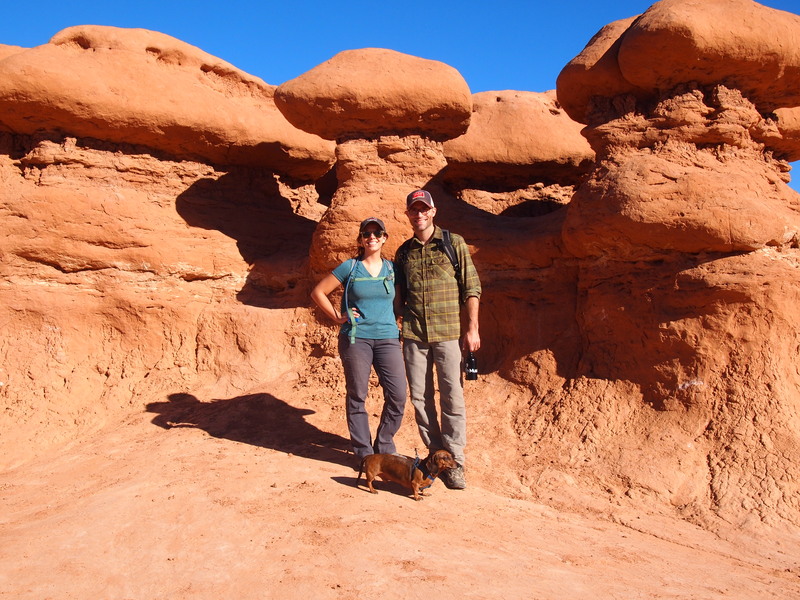 There are three hiking trails in the park and none of the descriptions were very helpful. I had read about them briefly before our trip, but I hadn’t firmly decided on one over the other. Normally it wouldn’t matter that much, but I like to know ahead of time if Truman will be able to do the hike. 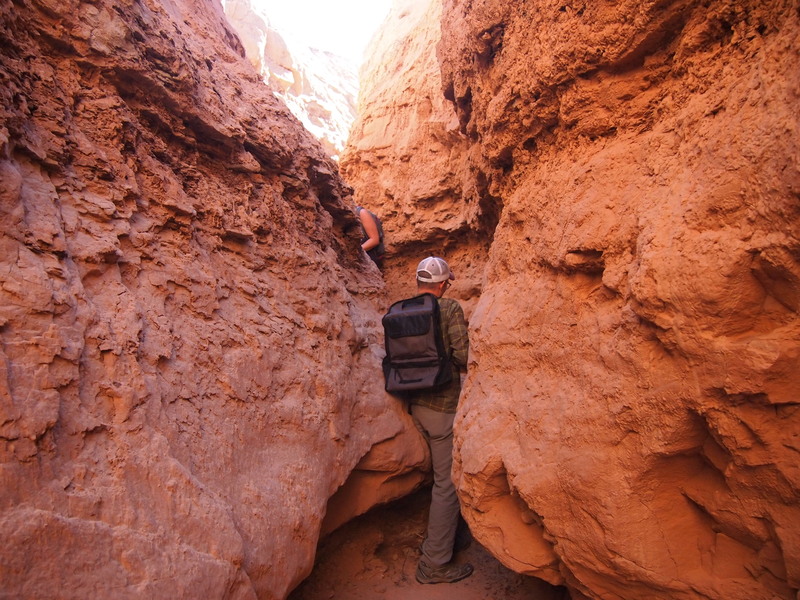 We ended up doing Carmel Canyon, a short 1.5 mile jaunt starting above the valley floor, descending to a wash below, and finally snaking and scrambling through narrow canyons to the parking area again. 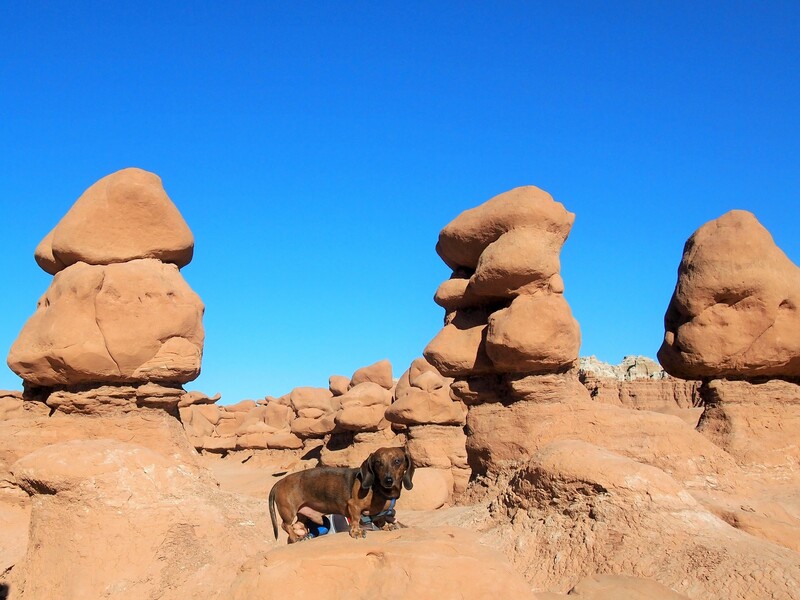 It was a great hike for Truman, and he was overly enthusiastic about it, running much of the way. 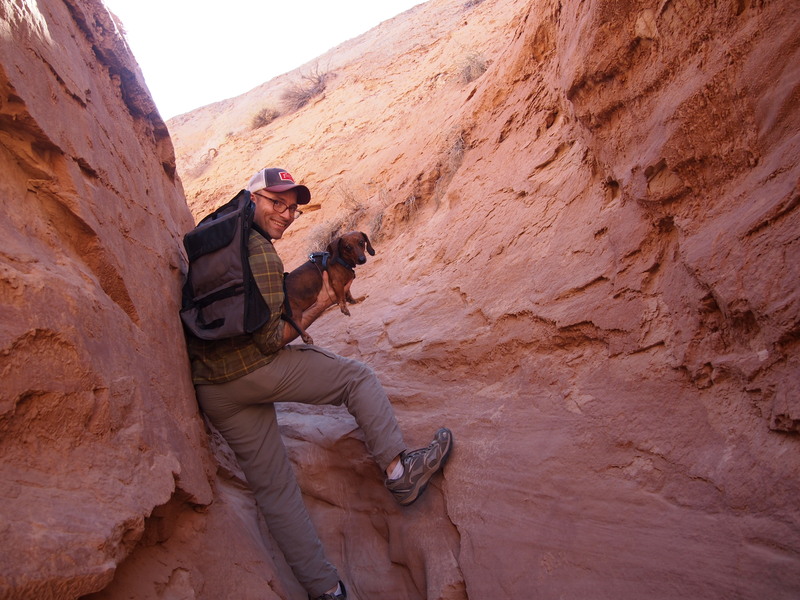 Some of the scrambling at the end was a bit tricky with him though. One of us had to hoist ourselves up over the pour-off while the other passed Truman up. Only the last pour-off was particularly difficult. It was a really fun little hike.